Carolina Beach’s new $44,000 town hall and auditorium project was approved by President Franklin D. Roosevelt on December 8, 1939. The Works Progress Administration (WPA) was to supply $20,000, and local amounting to $24,000 was to be made available through a special bond issue. Shortly thereafter, Mayor R. C. Fergus announced that funds were also available for a new sanitary sewerage system which was to replace the septic tank system then in use and had proved to be inadequate, inefficient and unsanitary. The new system was to cost $188,000, of which the WPA would pay $125,000. In March, 1940, the WPA ofiice in Raleigh put their stamp of approval on the construction of the town hall, municipal auditorium, to seat approximately 800 people, jail and fire department building for Carolina Beach. The final cost figure arrived at was $39,938. The site for the new structure was located on reclaimed marshland [now the Town parking lot across from the Winner boats] acquired by the town sometime earlier for $27. The project was to give work to 30 laborers and was to be completed in five to six months. Mayor Fergus began negotiating a loan through the Reconstruction Finance Corporation (RFC) for additional to pay the costs of materials. Bids for construction were opened in August, 1940, and construction was to begin on September 1st, to be completed by the opening of the 1941 beach season. Problems intervened so that work did not begin until December, 1940, and another delay halted work until September, 1941. In April, 1941, the local Chamber of Commerce was getting into gear and exerting every effort to make Carolina Beach, with its new auditorium under construction, the convention headquarters for Eastern North Carolina. The auditorium was to provide an ample stage for shows, cooking schools, community gatherings and other convention headquarter needs. Space was to be provided also as a meeting place for local civic clubs, bridge parties and other social functions. 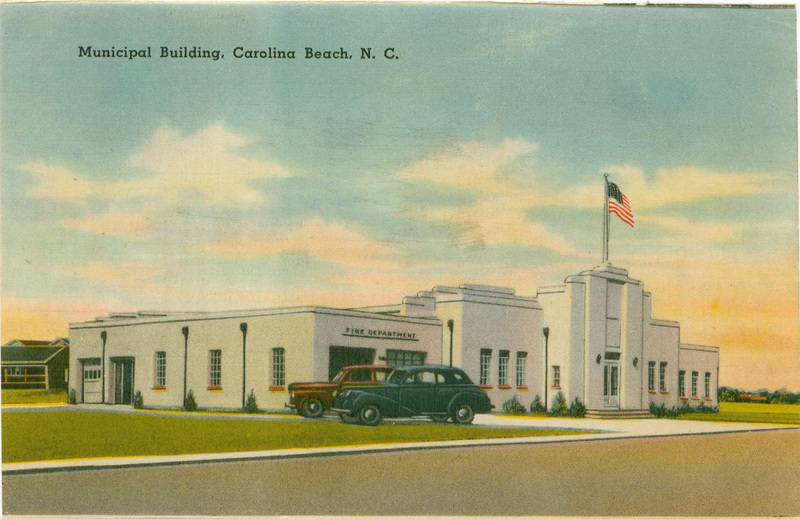 The new auditorium of Carolina Beach’s municipal building was used for the first time on January 30, 1942, despite the fact that the building was not yet completed. The event was the celebration of President Roosevelt’s birthday with a ball to raise funds for the fight against infantile paralysis (polio). The committee of arrangements for this initial event in the new auditorium was Capt. Leo S. Iobe, head of the US. Army‘s Carolina Beach recreation area, as director, and other members included Mayor Fergus, Lewis, B. Shepherd, C.M. Kelly, Dudley Humphrey, W.G. Fowler, Lt. Warren Burkholder, Frank Rossetta, Mrs. Lewis, Mrs. Warren Burkholder, Mrs. C.M. Murrin, Mrs. H.C. Fields, Mrs. Albert Harris, Mrs. Brewer, Mrs. C.G. Vanlandingham and Mrs. D.M. Greer. The new building was 114 feet wide and 132 feet long, and the auditorium was 44 by 91 feet. There were four offices, fire department section, jail for whites, jail for blacks, 12 restrooms, a kitchen, two dressing rooms and a recreation room for volunteer firemen. It was plastered on the interior and stuccoed on the outside, and painted white throughout the interior, with green woodwork.